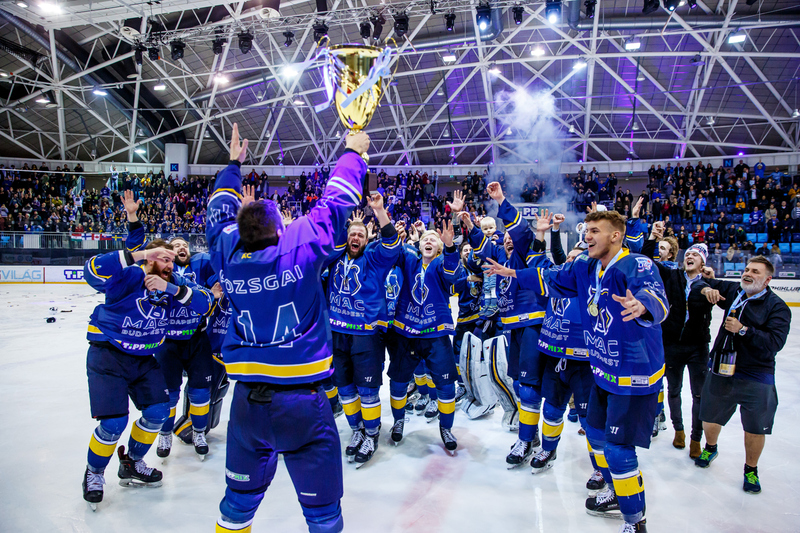 MAC Budapest won their first league title in team history as they defeated DVTK four games to one in the best out of seven series. MAC took games one and two on home ice before the series moved to Miskolc for games three and four. The series switched back to Miskolc, Bálizs and Adorján were the two starting goalies. The game started off well for DVTK as they scored on the first shift of the game as Nikandrosz Galanisz jumped on a loose puck after a turnover and riffled it past Bálizs for the 1-0 lead. Later in the period Keegan Dansereau setup Tomas Klempa for a snap from the left side of the slot for the tying goal. Before the opening period was over MAC had flipped the score as Zsombor Garát ripped an absolute rocket from high in the slot that ended up past Adorján. Just over a minute into the second period Chris Bodó scored from just outside of the crease to put MAC up by two goals. Later in the period Galanisz scored his second goal of the game on a power play to make it a one goal game. The score remained the same, late in the game DVTK called timeout and pulled the goalie for the extra attacker but were unable to tie the game up. The fourth game of the series was must win for DVTK as MAC was one win away from claiming the ERSTE Liga title. Both coaches stuck with the hot hand in net. After a scoreless first period the opening goal did not come until the 29th minute when Tomas Klempa took a loose puck, skated in from the write wing and snapped a shot of the far post and past Attila Adorján for the goal. Minutes later Rasmus Kulmala tied the game up at 1-1. Later in the period Bálint Magosi scored a short handed goal that squeezed through the legs of Bence Bálizs to give DVTK their first lead of the series. In the closing minutes of the game MAC called timeout and pulled the goalie for the extra attacker however Galanisz scored an empty net goal to make it 3-1. With two seconds left in the game Peter Sakaris scored a goal to set the final score at 4-1 as DVTK survived to live another day. Game five was played in Budapest, Adorján and Bálizs were the starting goalies for their respective teams. Rasmus Kulmala scored first for DVTK as he took a shot from the left hand side of the slot to make it 1-0 in the first period. WIth less than two minutes left in the opening period Chris Bodó put a rebound home to tie the game up at 1-1. MAC took their first lead of the game when Zsombor Garát lifted a shot on net from the blueline that Adorján saved, however Terbócs was on the spot to tap in the rebound. The game remained unchanged until the closing minutes of the game when Ákos Berta put a rebound home. With the game tied at 2-2 at the end of regulation the game went to overtime. In the extra session Jesse Dudás took a pass from Jared Brown on the left wing skated down into the corner and threw a pass in the direction of the net that caught Adorján off guard and ended up behind behind the DVTK goalie for the championship clinching goal.